Master bedroom with sliding door opening to deck. View from back of home. State and local taxes of 12.45% will apply. 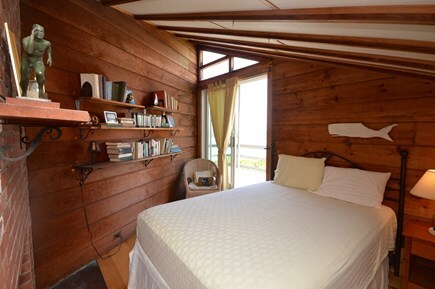 This adorable cottage is situated on the bluff overlooking Nauset Beach, on the water on Nauset Heights. 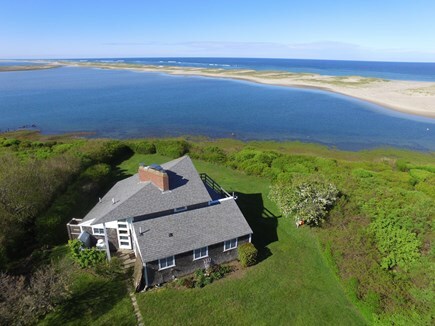 Short walk to both inland waters and Nauset Outer Beach. This property has panoramic ocean, beach and water views. 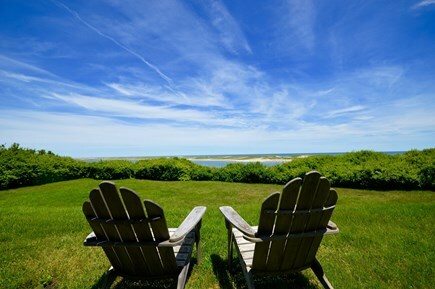 Very private family owned vacation home with spectacular views of Nauset Beach. 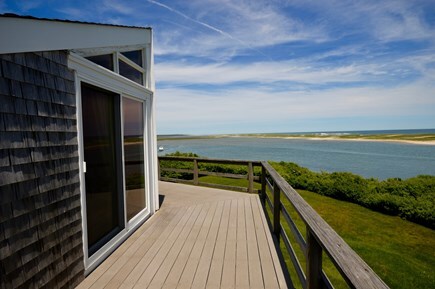 This four-bedroom, one-and-a-half bath house has a panoramic view of Nauset Beach. 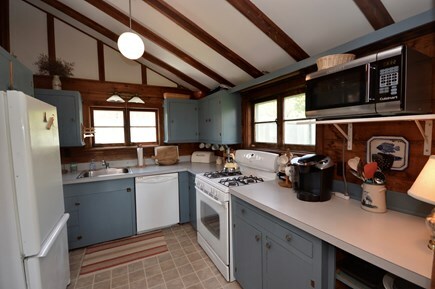 It has a living/dining room, sunporch, two bedrooms and a full bathroom, a fully equipped kitchen with a dishwasher, and washer and dryer on the main floor. Upstairs are two more bedrooms, both with access to the newly refinished upper deck and a half-bath. There is an enclosed outside shower and beach access is .2 miles to the stairs down to the beach. It has cable/color HDTV and Wi-Fi, but with this view, who needs TV and the Internet? 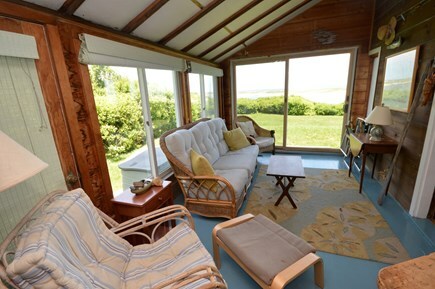 Unbelievable location and value so close to Nauset Beach, Nauset Inlet and Mill Pond! Great for walking, kayaking, relaxing beach walks and SUP. Any issues with accidents - urination or throwing up? Any issues with chewing furnishings? Barking while unattended or while attended? Are you confident you can leave property with no sign of your dog when you check out? Do you accept full responsibility for the behavior and impact of dogs in your group during your stay? Guest Access: Whole home and grounds including outdoor furniture, grill, etc. Interaction with Guests: As much or as little as they like. The Neighborhood: Beautiful walks on the seashore and bucolic private roads just outside your door. 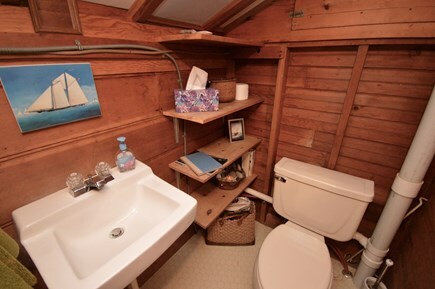 The unique part about this property is the location for the price. There are many walks to scenic vistas right out your door. People come from around the world to Nauset Beach and you can walk there in 5 minutes from this property and the walk is quite beautiful in itself. Here is a quick list of some cape activity/area suggestions I send my renters. *Also Priscilla beach is nice and on “inlet water” side. You can walk all the way around the seashore here in both directions (its public property and part of National Seashore), going out towards ocean along shore leads you back to the Nauset Heights Association steps. Priscilla Landing is here :CLICK HERE. Parking in dirt parking area is public. Just don’t try to drive your car out onto beach (you will get stuck without 4wd and air tires down). * The ''Cape Cod Rail Trail” bike path (you can rent bikes at many points along path - including right in town in Orleans and you can park at mid-cape home center next to the path). If you go north from Orleans, there is a great authentic French bakery/bistro called PB Boulangerie in Wellfleet at the end of the bike path. *explore Wellfleet - cute town, lots of galleries, good food. *explore Provincetown - lots of fun. very artsy/bohemian. 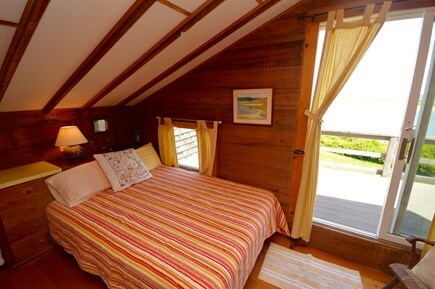 Additional availability info: This is a Saturday to Saturday vacation rental. Additional pricing info: There is a processing fee and damage waiver (in lieu of traditional security deposit), State and local taxes of 12.45% will apply.